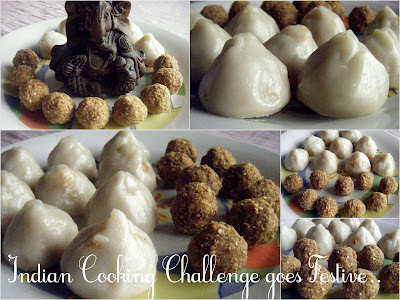 Easycooking: Indian Cooking Challenge~Vinayaka Chathurthi Special!! Indian Cooking Challenge~Vinayaka Chathurthi Special!! When Srivalli announced the dishes for this month's challenge,I was a bit skeptical.She said lets plan someting big for Vinayaka Chathurthi and hence make dishes around the theme.I was going through the dishes mentioned and there I saw it...Modaks..I know Lord Ganesha and Modaks are synonymous with each other but..you know,I can never get the consistency right for the modaks and every year I end up saying sorry to Him for not making Modaks.So I was in a tiff whether to attempt the challenge. Last week,during Vinayaka Chathurthi,I attempted it after all.I was tensed and followed the recipe to the T.While shaping it I was literally praying aloud[for a change not yelling:)].Though the shape came out well[I even got the pleats right!! ],the top half was a bit hard and became harder on cooling.So I decided I would attempt it again.A challenge can't be taken so lightly,can it? ?I donned my apron again yesterday.Made both Ladoo and Modaks.Though the modaks came pretty well this time,while cooling down,the same problem arose,they became kind of hard and chewy.Though there were only one or two left:).Did you guys have that problem or was it only me.If so can you please suggest any tips how to keep them soft?? Sesame Ladoo was something I have never tried making.I followed Srivalli's recipe-the easiest recipe I have come across.Though while binding the laddoo,I cheated and added a few sprinkles of water,rest I followed the exact recipe:). In a bowl, take the flour and make a smooth paste with enough water. This is to ensure, you don't get lumps when you cook the flour. Boil the rest of the water in a pan with salt. Once it starts boiling, add the rice flour mix. and cook. Making sure there are no lumps.Add 1 tsp of oil and keep stirring. Remove when it forms as solid with the sides leaving. Remove and cover with a damp cloth so that it remains hot. Once everything is done, steam it for 10 mints. Wash Sesame seeds well and dry them under sun. Dry roast them in a tawa and let them cool. Once they are cool, take about 2 - 3tbsp of grated or powdered jaggary and run in a mixie. 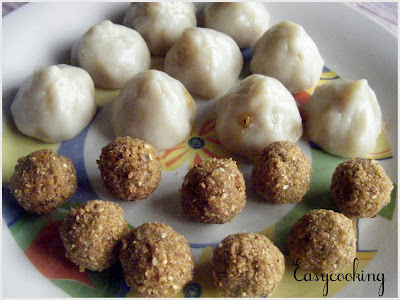 The amount of jaggery normally depends on the formation of laddoo. When you make a laddoo, it should stay in shape. Then you know the amount is enough. Also it depends on the fineness of the sesame powder. When you run in mixie, it becomes little oily which will help in holding the laddo shape.For about 100 gms of Sesame seeds,use some 3 tbsp of Jaggery. Wishing all of you a very Happy Vinayaka Chathurthi!! Just wow!! Lovely creations Divya! Such a delicious treat, both have turned out marvellous for u..
Divya, not to fret. All kozhukkattais turn a bit hard while they get cold. Keeping covered in a damp cloth helps. However, you have done a great job there. these look good! makes me wish i should have tried the sesame ladoos as well...mayb i will!!! The entire spread so good Divya. Yum.Ganpati is surely happy with you! Oh yeah even i had the problem with themodaks, so i would re heat it in the microwave and then have it. Looks lovely though. Looks delicious! I'm sure your Lord Ganesha was very happy! Wow!! they have turned out soo perfect dear. Lovely spread and belated wishes. looks yum Divya, perfect shape. Wow.. tempting kozhukattai..! Great picture divya!! so beautifuly shaped and tempting entries divya. Divya, both of them look awesome. 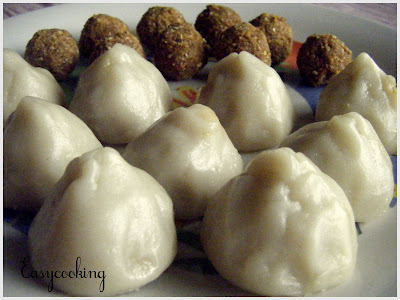 The modak has come out really well and they have been shaped out so well. I LOVE modaks!! Both kinds! Yours look delicious!